Think about that #1 on your bucket list trip… it is monumental! You imagine what it will be like. You build it up in your mind and you think,” I hope it lives up to my expectations!” On Friday, June 15th, 2018, that day came for me. Joe, my husband, and I rose at 3:30 a.m. to get in line for the first set of buses from Aguas Calientes to see sunrise at Machu Picchu, a photographers dream! Hundreds of people lined the road. 15 buses will take the early risers up the mountain to the ancient city at 5:30a.m. Upon arrival, you still don’t see the city, anticipation is building. After passing through the gate, we walk down the path and around a corner …THERE IT IS! I feel a catch in my throat… words cannot express the feeling you have when first viewing this amazing spiritual sanctuary. Awe…Wonder…Amazement…the ancient, sacred city of the Incas is right before my eyes. I imagine the leader of the Incan empire, topping Machu Picchu mountain at the Sun Gate and seeing the landscape before him. “There, that is where we build it”, he may have declared. 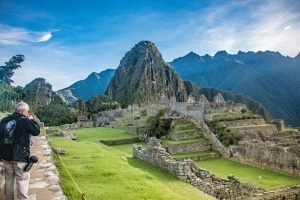 The Incas’ chose this location, at the top of a mountain, because it was close to the heavens. In addition to its proximity to heaven, the location was chosen due to the astrological significance of the reflections of the constellations and the precise positioning of the sun rising over the mountain on June 21st, the summer solstice. Close to the heavens, yet made of solid granite! How in the world could they have created this masterpiece of architecture and engineering? Imagine, if you will, clearing a site to build your dream home, on the top of a mountain. It would be a monumental task with today’s equipment and technology. Geologists have said , “It is impossible, there are geological faults on either side”, yet somehow this site was created 600 years ago, proof of the astonishing ability of the mind of man! We spent 7 hours wandering through, not ruins, but actual structures. Today, 80% of it is still in-tact, built to withstand the test of time. The mountain was essentially leveled off, built like a giant pyramid, with terraces creating the foundation. Rock quarries were created where the granite from the clearing was cut and shaped to create the temples and structures. The walls have an 8-10% angle to withstand the stresses of an earthquake. Terraces on the warmer, east side were used for agriculture, while the west terraces maintain the structural integrity of the mountain. Our guide from Wayki Trek, Edgar, points out the differences in the structures built for habitation and those built for God. The larger stones were used for the sacred temples and were cut with surgical precision, using tools made of hematite. Each one fit perfectly to the other. The homes, by comparison, have smaller stones with rounded and imperfect edges. 20-25,000 workers spent 70 years building this respite for the Incan empire. 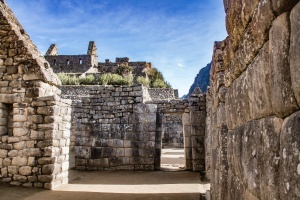 Then, in the 1500’s, as the Spanish conquistadors were invading Cusco, the Incan King ordered the site to be abandoned, so it would not be found and taken over by the Spaniards. After perusing the location for a few hours, we could not resist the chance to see the site from above. 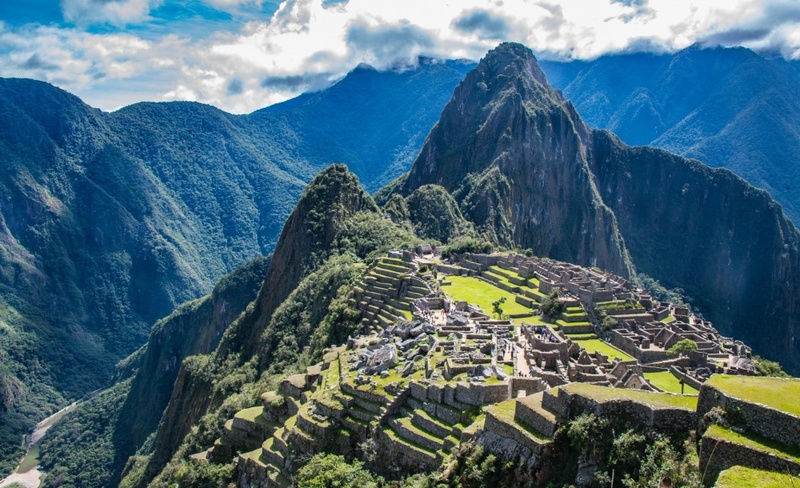 Machu Picchu mountain gives the perfect overview of the entire complex. 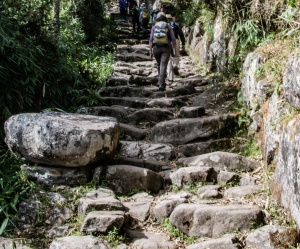 Hiking up the stone steps I think to myself “I am walking the same path, on the same stones, the Inca used in route to worship their God 600 years ago!. These sacred steps were their “Passport” to Heaven . Check out my slideshow of Machu Picchu images and follow Lisa Duty on Flickr. 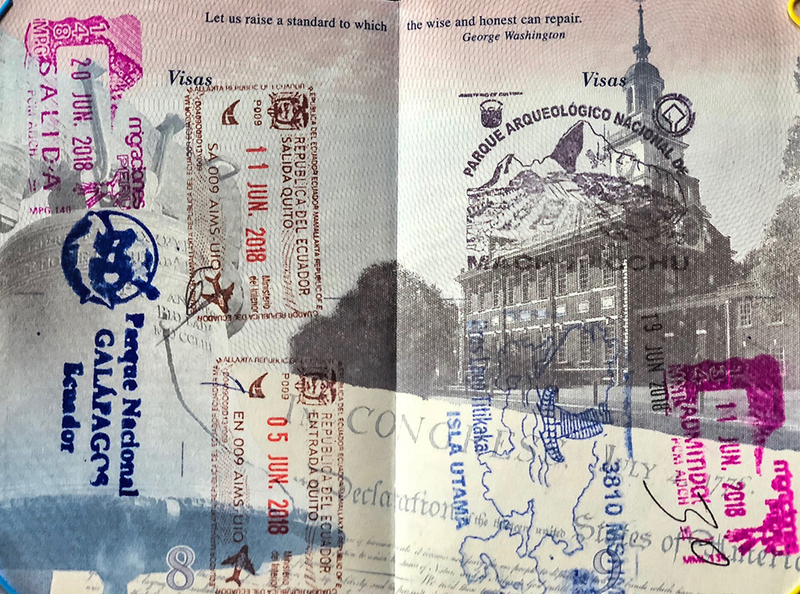 More Travel Photography blogs and Flickr albums to come from Galapagos Islands, Ecuador and Lake Titicaca! ← Galapagos Islands 2018 -Part I: Here come the Boobies!